› Outlook › Archiving › What is the difference between Export and Archive? Can someone explain the difference between the Export and Archive functions in Outlook? 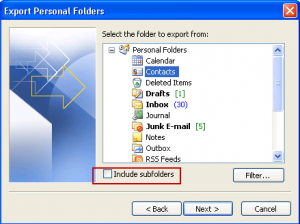 I would like to save selected folders of emails to a file that is external to the primary PST file. I may want to reload them at some point in the future so that I can read them, reply to them, or whatever. I started the Export function and I see that I have the option of selecting a PST file as the output. Is that the way to go? I Export with the PST output option the same as Archive -- or at least does it create the same type of output file? I was afraid to try the Archive function until I know whether it will delete the emails and whether I can get them back, if I want to. When you use Export, you create a copy of the items in a Personal Folder file (.pst). When you use Archive, you move the items to a .pst file. So… while Export copies the items you are exporting, Archive removes them from your current data file. You would use Export to create a backup of your data, especially when you are not using a pst file, or to create a copy to use on another computer. Note: if you are using a .pst file you should copy it, not export, to create a backup. Use Export if you just need one folder (or a few), not the entire contents of the pst file. You'll also use Export with Outlook.com accounts, and to back up Calendar and Contacts when you have an IMAP account in Outlook 2013. You'll use Archive when you want to remove older items from your active data file. You can also use it to delete Junk Mail and Deleted Items. When you want to view the Archived items in Outlook, open the Archive file using File, Open, Outlook Data File, don't import the archive. If you want to archive files, the best thing to do is store them on a different volume, preferably a different hard drive. While you can put non Time Machine files on a Time Machine volume, you don't want to. If Time Machine gets corrupted, or you want to rebuild it, the best way to do it is to reinitialize the drive. You don't want to try to delete the files in a Time Machine archive - it would take hours and hours.